Famous (or infamous) for their flashy advertisements and curative promises, patent medicines had their hey-day of popularity in the late 1800s and early 1900s. Patent medicines existed to cure or prevent nearly every thinkable ailment: from pimples, to cancer. Many claimed to be effective against a large range of ailments, both internal and external. Patent medicines were available from travelling salesmen, at fairs and carnivals, by mail order, as well as from local merchants at drug and general stores. Many of these cure-all “medicines” were quite dangerous and toxic in their composition. They often contained high concentrations of alcohol, cocaine, morphine, or opium as their main ingredients. Until the early 1900s there were no oversight as to what went into these remedies, and in what quantity. Accidental poisonings, overdose, and addiction were common. Fellows’ Compound Syrup of Hypophosphites. 1990.142.2, BV Museum Collection. Shockingly, this popular patent medicine contains strychnine, a highly toxic substance commonly found in rat poison and other pesticides! In high doses, strychnine is very toxic to humans and poisoning by inhalation, swallowing, or absorption through eyes or mouth can be fatal. 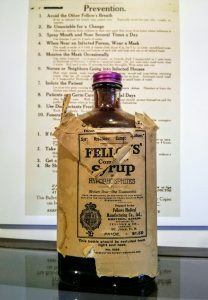 Despite its potential toxicity, Fellows’ Compound was manufactured and sold into the early 1900s. Our Fellows’ Compound bottle still contains its original liquid – making it a somewhat hazardous artifact to keep in our collection. Staff deal with this hazard by wearing nylon gloves whenever they handle the bottle, and ensuring that it is well protected by archival foam while in storage. A red “hazard” sticker on the packaging warns anyone who might handle the wrapped up bottle. Another fascinating patent medicine from our collection is “Dr. Thomas’ Eclectric Oil” (nope, that’s not a typo!). 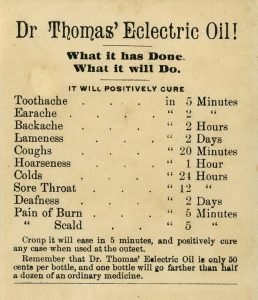 Dr. Thomas’ Eclectric Oil was invented by Dr. S.N. Thomas of New York in the mid-1840s. It was sold in Canada by Northrop & Lyman of Newcastle, Ontario, who had an agreement to manufacture and sell the patented remedy. Eclectric Oil was an all-purpose internal and external family remedy intended for use by people, and animals. It contained spirits of turpentine, camphor, oil of tar, red thyme and fish oil. The manufacturers of Eclectric Oil claimed to be able to cure everything from toothaches, to “lameness”, and deafness. The word “eclectric” is thought to have been used to invoke a connection to electricity. In the late 1800s and early 1900s there was a great belief in the curative powers of electricity, and many patent medicine makers used the words “magnetic” or “electric” to name their products. Period advertisement for Dr. Thomas’ Eclectric Oil. Our Fellows Compound and Eclectric Oil bottles, as well as a number of other patent medicines from our collection, are currently on display in the Museum as part of our new INFLUENZA: The Spanish Flu in Smithers exhibit. Drop in and check them out for yourself!